Fort Thomas’ Haley Yeager is the event coordinator for this year's Safety Awareness Day to be held in the Target parking lot on Saturday Aug 6 from 10 - 2. The event is hosted by both AAA/Bob Sumerel Tire & Service and the Newport Police Department and is always a fun family event. Haley says that police and fire will bring a variety of safety vehicles for guests to see. And there will be preliminary maintenance inspections from Bob Sumerel Tire and Service as well as free car battery checks. A big attraction will be the Shred-it Truck where people will be able to bring documents to be shredded at the site.There will also be a variety of safety booths, interactive activities, and free food from Buffalo Wild Wings. Bicycle Safety: Children will learn how to be safer in the community when riding their bikes. Fire Safety: Fire Trucks and firefighters will be on-site to talk about safety in the event of a fire. Neighborhood Safety: Police officers will explain how to be safer in your community. Tiny Town: Police officers will educate on basic street rules while kids ride around on bicycles. Kids Workshop: Kids can build their favorite items from the event. Car Seat Inspections: Certified Technicians will be on-site to make sure their children’s car seats are properly installed. Master Fry: Master Fry's defense system will be there giving demonstrations on how to defend yourself. Rosie Red will make an appearance at the event so guests can take pictures with her and have some fun. Haley says of her role that It has been a great experience connecting with different vendors and community leaders. She adds that This event has been going on for 4 years. The event promotes AAA's value of safety and knowing the importance of both being a part of the community and educating them on how to be safer. The event is definitely growing with more people and vendors added each year! We expect anywhere from 300-500 people to attend and check about 60 car seats throughout the day. I would like to tell people that is a great event that has something for everyone in the community. 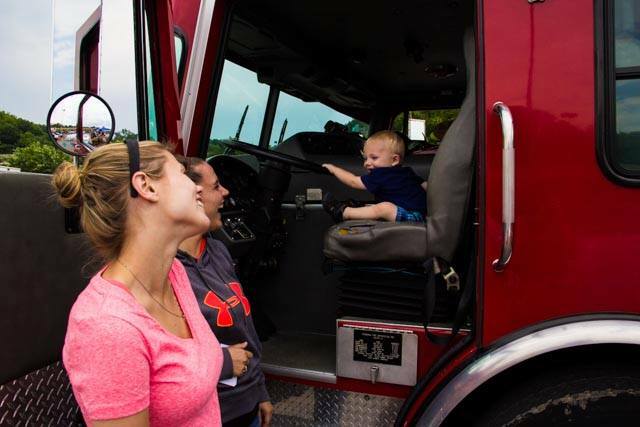 Whether you need to get your car seat and car check, or just want to come walk around and enjoy the many vendors, you will be sure to have a good time. There will be quite a few giveaways and free food from Buffalo Wild Wings as well. We look forward to seeing you there!